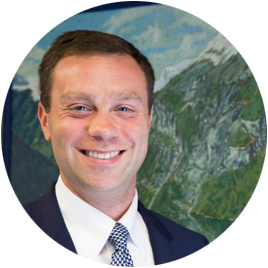 Kyle Piro has extensive experience advising clients in all aspects of matrimonial and family law. Kyle is a tireless advocate for his clients, guiding them through some of the most challenging transitions in their lives. Known for his straightforward and responsive approach to representing his clients, Kyle is as successful in litigation as in settlement negotiations. Kyle concentrates his practice in family law, particularly complex and high conflict divorces and custody cases that require creative solutions and fierce advocacy. Kyle is an active member of the Deschutes County Bar Association. He has served as chair of Central Oregon Matrimonial Attorneys, a group of family law attorneys that meets monthly to discuss issues of family law. He also participates in numerous economic and business development forums aimed at increasing Central Oregon’s business climate. Kyle is a member of the Advisory Board for Big Brothers Big Sisters Central Oregon and he previously held the title of vice chair. Prior to joining Stahancyk, Kent & Hook, Kyle volunteered at the St. Andrew’s Legal Clinic in Portland where he counseled and advised low-income clients on family law concerns. Kyle has two young children. He and his wife enjoy spending time with them by sharing their love for skiing, hiking, and camping. Before enrolling in law school, Kyle lived and worked in Russia for three years. While there, he gained an appreciation for Russian language, culture, and literature. “Kyle Piro provided me with excellent representation when I needed it the most! He is a consummate professional who was always extremely well prepared and effective… He did so in a conscience and kind manner handling my often difficult spouse extremely effectively. He consistently worked his tail off on my behalf throughout my highly contentious and complicated divorce. His hard work and extensive preparation made a huge difference in the outcome of my case… Thank you Kyle!” – Y. “An attorney, who did not handle divorce cases, originally referred me to Kyle; which by itself is a testament to Kyle’s ability and reputation. I soon learned that his reputation is well deserved. Kyle was competent, well versed in the law, and consistently offered ideas to help conserve assets and minimize my cost throughout the process. He listened to my concerns, yet kept our conversations focused, and helped me eliminate issues that were irrelevant to the case. I highly recommend Kyle, who was quite skilled at helping me achieve an acceptable outcome from an otherwise intensely unpleasant circumstance.” – M.